Using a variety of mechanical separation devices, IVI removes heavy particulates from air streams. Two common mechanical separation devices are cyclones and classifiers. IVI can customize either of these devices to fit any unique application as a means of meeting efficiencies, pressure drops and space requirements. to the heel of the classifier and downward towards the hopper. 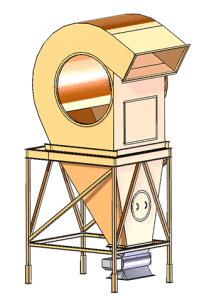 The cleaned air exits the classifier horizontally and the particulates are removed from the hopper through an airlock device. Air enters a cyclone through a horizontal duct and is then spun on a vertical axis. The clean air exits through the top the device. Cyclones can be more efficient capture devices than classifiers and thus, typically have a larger pressure drop across them. Other mechanical separators use baffle plates, gravity and screens to separate material from the air stream. IVI has built a large variety of these devices and can customize them to fit your needs.